For those of you new to my blog … Welcome! My name is Ali … and I have created the “China Quad Diaries” so you can follow my adventures in China while I participate in an innovative spinal cord injury rehabilitation program available only in the sub-tropical city of Kunming, Yunnan Province. The program was created by the Peoples Liberation Army … yes a military program, and requires my working six hours a day, six days a week for at least six months until I start to regain motor function. Before I get into the details about how I broke my neck, which occured 2 1/2 years ago, I’ll tell you little bit about myself, seeing as I was not paralyzed for the first 27 years of my life! Those of you who have known me for years would have called me a crazy and adventurous person before my accident … I guess still a little nuts anyway, seeing as I am about to enroll in a military-developed rehab program on the other side of the world! I have lived all over the world, including Europe, the United States, China and Australia. I always believed in living every day to its fullest, whether it was backpacking for months in the Australian outback , moving to China when I was 16 years old and landing myself in jail for a few days (for forgetting to travel with my passport) or going on survival camping trips with my family in The Bahamas. Finally, I would not be here today writing this blog if not for my friends and family. You know that expression “it takes a village to raise a baby” ? 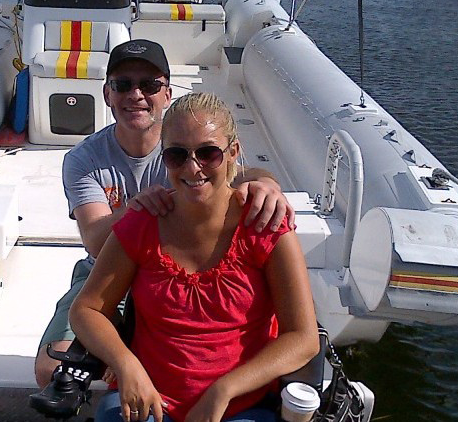 Well, it takes a village to help a quadriplegic get back her life back together. Without a great support system I would not be going to China today. So … a huge Thank you to all my good friends and family who have helped me along my journey over the last several years. At the beginning of 2010, I moved from Miami back to Cat Island in The Bahamas, where my family has had a home for the last 40 years. I quit my job with non-profit Generation Engage and moved home to study technical trading of financial assets. I figured the best way to be effective in the non-profit world would be to serve as a donor, and that meant learning how to make money with money. Fortunately, I guess, I broke my neck and not my head, so this career is still open to me. On Saturday, August 21, 2010 I was a guest at a very cool new Tikki bar built by some local guys on the Western shore of Cat Island over shallow water. It was dusk when I took a pre-dinner dive into water that was obviously shallower than I thought. Right away, from my wildernes training, I knew I was in serious trouble, but I never lost consciousnss and was pulled out of the water by a nearby girlfriend. It took about 18 hours for an emergency jet get to the island and fly me back to Ryder Trauma Center in Miami, where I was rushed into surgery for a spinal fusion of C5-C7. This accident left me a C6 quadriplegic … in plain English, what that means is that I am paralyzed from the chest down … my triceps are paralyzed, and I have no finger function. I spent three months in rehabilitation at Jackson Medical Center in Miami reading and learning as much about spinal cord injury with my family as we could. We discovered that most rehabilitation programs in the U.S. focus mainly on Occupational Therapy — that is, on getting the patient functional to perform daily living activities, but not actually on re-gaining useful motor function. I wanted a more robust program focused on agrressive Physical Therapy, so over the past 2 years we created our own hi-tech rehab operation in an apartment in Miami. During this period, I would wake up every day before dawn, six days a week, and alternate between physical therapy, weightlifting, cardio, swimming and functional electrical stimulation with leg and arm cycle. While my workout routine has been intensive, the bottom line is that I have not regained signficant motor or sensory function, which is precisely why I am now headed to Kunming, China. Needless-to-say, when you are paralyzed on 80% your body, your life changes hugely. I’m not going to say it hasn’t been really tough, but somehow I just keep going like the Energizer Bunny, and I know I can attribute much of that to the incredible network of people supporting me. I am one of the first foreigners going to China to participate in the innovative and successful Kunming Walking Program, which was developed over decades by the Peoples Liberation Army but has been available in the private sector to international participants only since June 2012 . If successful, I hope to work with many other disabled people so they can come to Kunming and join me for some good old-fashioned hard work! Please feel free to reach out to me with any questions or comments. I saw a post about your blog from Tiffany on Facebook and I read your story. I think you are so strong and I am glad you are taking the risk to live in China and fight for what you want in life. Your positive energy radiates from your words. My thoughts and prayers are with you on your journey. Much love, hugs and good vibes from the US. My husband and I visit FBV every year, and little April was visiting me all week at the Point House. Her visits started the conversation that lead Pam A. to mention that you had a blog, and she gave the name to me. We met you once on a flight from FLL to Cat Island. You are one that is hard to forget; I immediately knew you had a very high energy and great love for all things. I am not surprised with your commitment, and robust attitude toward your challenges and outlook. I applaud you. I hope you don’t mind if I share your blog with a few of my friends at an organization that I volunteer; we provide therapeutic horseback riding to adults and children with traumatic and acquired brain injury, your story is an inspiration. PS: I took a picture of April and emailed it to your mom…. I met your father this past week at an event for the International Society for Stem Cell Research. It’s a great organization that helps keep the flame alive for difficult, long-term research needed to ultimately help people like you. Your blog and all the details are amazing. I particularly like your humorous observations and photographs (whitening cream, kissing condoms, yogurt sitting in the midday sun). Keep them coming! I wish you the very best with your upcoming operation. From all I have read, it seems certain to alleviate your pain and allow you to improve your condition. My father had a laminectomy once on his spine and (not to get your hopes up too much) immediately after the operation his pain diminished. However the reconstructive surgery on your spine, which he did not have, may delay things. What a pleasure to hear from you and I’m so glad that you are able to meet my father at that International Society for Stem Cell Research. He is truly an amazing man and I would deftly not be here without him today. mix it thoroughly. cup of raw seeds or nuts, or 1. Pores can often seem enlarged when they’re blocked with oil. yeast). A food recipe that always been part to be a Filipino. You need 2 tbsp of horse gram to arrange the soup. The best to you on your road to recovery. I don’t know if you remember me, but I was the manager at Bodies in Motion, Pasadena. I actually signed you to a membership when you were a student at Occidental College. You were a favorite because of your positive outlook and kindness to others. I heard about your accident and it was not a good thing to know. I pray that your condition improves. Keep that incredible spirit and strive towards your goals. Take care and best wishes.